hit the road and #letsmodo! Summer time is road trip time for many Modo members. This past weekend, we had some new wheels in the fleet that needed a temporary home, so rather than let them sit idle in a parking lot, we challenged five members to take Modo on the road – and share the adventure through photos, video and social media. #LetsModo showcased Modo trips from Summerland wineries to Birkenhead Lake Provincial Park to Cultus Lake, and even a pit stop at the Langley Drive-In. Do you have a long booking coming up? Share your experiences on the road with #LetsModo – we'd love to see them! Get the full story of #LetsModo on our Storify. 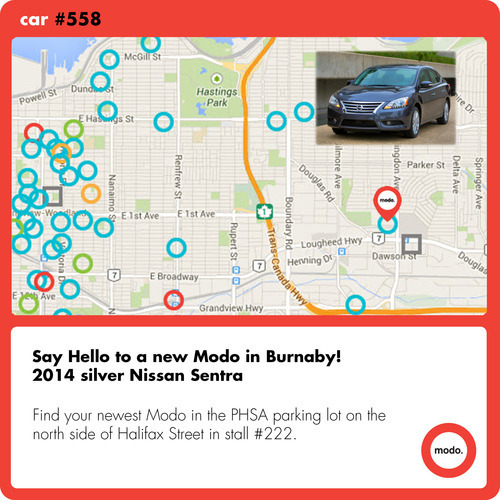 vote modo in the best of vancouver! While carsharing works for lots of different types of trips, there are occassions when renting a car is more affordable than booking a Modo. To help members get the best rate on every trip, we've lined up some great rental perks! 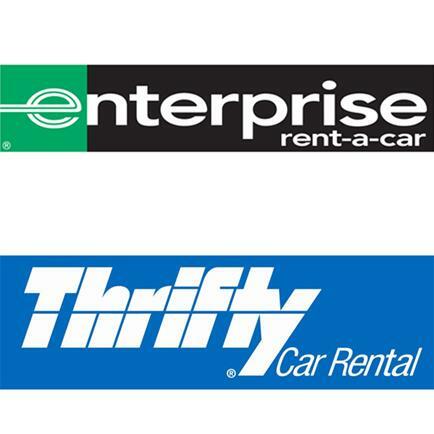 Get either a 5% discount from Enterprise, or take advantage of Thrifty's fixed rates for Modo members. Co-op members can also take advantage of rental insurance administered by Modo. Before your next long booking, use our Trip Cost Calculator to compare Co-op, Casual and Rental rates – this extra step just may save you a little extra on your next summer road trip! It's that time again – when the Straight asks city residents/experts to submit their picks for Best in Vancouver, and Modo is in the running! In between choosing the best neighbourhood bike shop and karaoke spot, we hope you'll consider casting a vote for Modo as the Best Carshare Service in Vancouver! Whether your booking is 1 hour, 1 day or 1 week, it's nice to know the total cost before getting behind the wheel. When you're making your next booking online, preview the cost with this trip estimator tool, as described in the handy pro tip below. Of course, the total cost for Co-op members won't be available until the trip is complete, in order to account for kilometre charges. Meet with the hosts, Board of Change members, and other local change makers, innovators and social entrepreneurs involved in building a more sustainable community in Vancouver. The evening will take place at the Rooftop Pop-Up Patio at the Westin Grand. Tickets include a drink, hors d'oeuvres and a chance to test drive a Tesla! Details and tickets here. There's now a 2010 grey Nissan Sentra (#352) instead of a 2009 Toyota Matrix. There's now a 2014 blue Nissan Versa Note (#516) instead of a 2007 Toyota Yaris. Find a 2013 red Dodge Grand Caravan (#556) instead of a 2010. Find a 2014 red Nissan Versa Note (#552) instead of a 2007 Pontiac Vibe. There's now a 2014 NIssan Rogue (#542) instead of a 2010 Nissan Sentra. 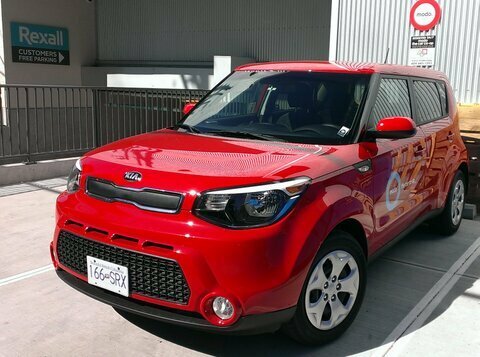 There's now a 2014 green Kia Soul (#546) instead of a Smart car. Our Honda Insight and Nissan Versa Note are remaining at this location. There's now a 2014 blue Nissan Versa Note (#553) instead of a 2011 Toyota Yaris. The other five vehicles are unchanged. A 2014 blue Nissan Versa Note (#560) is floating here until at least July 10. A 2013 green Fiat 500c (#512) is floating here until at least July 15. Find a 2010 red Honda Insight (#270) in a designated stall on the north side of Beach Crescent, at the foot of Seymour Mews, just east of the Granville Bridge. This summer, you may occasionally find a car on Union Street at Glen Drive, behind La Casa Gelato. A 2014 yellow Toyota Prius C (#549) is floating here until at least July 8. A 2013 white Dodge Grand Caravan (#548) is floating here until July 17. A 2014 red Fiat 500L (#529) is floating here until at least July 8. There's now a 2011 grey NIssan Sentra (#338) instead of a 2009 Pontiac Vibe. Find a 2014 white Toyota Prius V (#540) and a 2014 white Dodge Grand Caravan (#550) instead of a 2008 Toyota Prius. A 2014 white Nissan Versa Note (#557) is floating here until at least July 10. A 2014 grey NIssan Sentra (#559) is floating here until at least July 10. There's now a 2013 grey Dodge Grand Caravan (#544) instead of a 2009 red one. There's now a 2014 blue NIssan Versa Note (#551) instead of a 2012 Scion iQ. There's now a 2014 white Nissan Rogue (#536) instead of a 2010 Honda Insight. A 2014 blue Nissan Versa Note (#545) is floating here until at least July 10. Find a 2008 blue Toyota Prius (#215) in a Modo stall on the west side of Nanaimo Street, between Kingsway and E 30th Avenue, across from the El Dorado liquor store. There's now a 2014 white Toyota Prius V (#547) instead of a 2012 blue one. Find a 2014 silver Nissan Sentra (#558) in the PHSA parking lot on the north side of Halifax Street, between Rosser Avenue and Willingdon Avenue, in stall #222. A 2012 Toyota Prius V (#370) is floating here until at least July 8. Find a 2014 green Kia Soul (#561) behind the Rexall Drugs at 700 Sixth Street. Look for our stall next to the loading zone of the building, just off Seventh Avenue. >> PARTNER PRIDE Join us in saluting Modo Community Partner (and fellow co-op) Vancity for introducing a humane alternative to the high-interest "payday loan." >> ROAMING Planning a trip abroad and hoping to access carshare vehicles? Check out Modo's list of Roaming Partners. >> FINISH LINE Congratulations to all runners who completed the Scotiabank Half Marathon & 5k – glad we could share the day together! >> WE'RE LISTENING We get invaluable feedback from our members in our Annual Survey. See what you had to say. 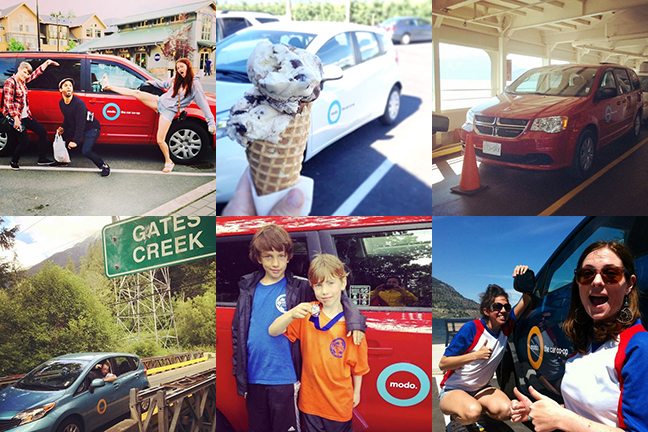 >> OGO REACHES 100 Our pals at OGO Carshare (a fellow co-op) just reached 100 members! Check out their awesome thank-you video. Don't miss your chance to get fresh produce grown at UBC Farm. Every Tuesday and Saturday at the farm, and every Wednesday at the UBC Bookstore. Visit the website for times and in-season produce list. Celebrate the completion of one of Vancouver's best public realm treasures! The Seaside Greenway connects Downtown to Jericho Beach and ready to be enjoyed. Bring your bikes, families and picnic baskets! 11–3pm. It's time to deck out your bikes in their neon finest because #BikeRave is back! Starting at Crab Park, join other cyclists as you pedal to a custom soundtrack while being part of a glowtastic mobile dance party. Photos from previous years here. Starts at 8pm. You’ve received this newsletter because you’re a member of Modo The Car Co-op. Want to send feedback about our newsletter? Email us at newsletter@modo.coop.